Whale watching season in Sydney is a great reason to get on the winter woollies and head to the coast. There are numerous vantage points all along the coastline but we’ve chosen the six best, most easily accessible and dramatic places to watch whales in Sydney. From these six places you have a great chance of seeing humpback whales up to 15m long and 45 tonnes just off the coastline. If you’ve never seen a whale before, it’s something special. With luck, you’ll see whales fin slap, fluke dive or even breech. Whale watching is the perfect motivation to get moving in the cooler months. Covering vantage points from the north to the south and eastern areas, here are the six best whale watching places in Sydney. Read on or click to jump straight to the detailed information on each below. To get the best out of your whale watching day – including the two best weeks of the year to spot whales – also check out our whale watching season Sydney tips. Cape Solander is where Sydney's official whale watching count takes place. It has information boards about whales and whale watching and is stunningly beautiful. It’s also some of the most amazing Sydney coastline. 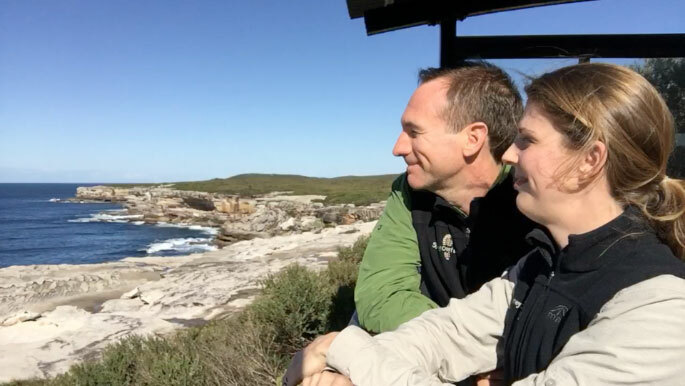 So, if you’ve seen enough whales for one day you can walk the Cape Solander Track south around the towering sandstone cliffs to Cape Bailey Lighthouse. It’s a gorgeous clifftop walk with vast ocean and heathland views. Continue past the lighthouse for views of Sydney’s longest stretch of beach at Cronulla. Wheelchair / Pram Accessible: Yes. Nearest food: Coffee and take away food in Kurnell, near the entrance to the national park. 3km from the whale watching platform. By Car: Park on Cape Solander Dr, Kurnell. Walking distance from carpark: 10m / 1 minute. Grade 1: Easy. It is a short walk along the footpath to the whale watching platform. Public Transport: Train to Cronulla. 987 bus from Cronulla to Kurnell. Walking distance from public transport: 2km / 25 minutes. Grade 2: easy. Alight on Captain Cook Drive near the gate to Kamay Botany Bay National Park. Walk onto Solander Drive and enter the national park. Approx. 500m on your right you will see a sign for the Yena Trail. Turn right onto this walking trail and follow to the end where it meets Solander Drive. Turn right onto Solander Dr and walk approx. 500m to the viewing platform. Barrenjoey Headland is a small peninsula with the vast stretch of Pacific Ocean to the east, the gateway to the Hawkesbury River to the north and gorgeous still waters of Pittwater to the west. If you had to pick one place for a short bushwalk with bonus whale watching, you’d pick Barrenjoey. The walk up the Smugglers Track to the lighthouse, with views down over Palm Beach and Pittwater is sensational, and the view from the top, well, check out the video. For directions, read more about the Barrenjoey Lighthouse Walk. The gateway to Sydney Harbour, eighty metres high and further east than all of southern Sydney, you can see whales coming for miles. Enjoy incredible views south along the cliffs to Bondi and beyond, and west towards Gap Bluff and South Head with the city skyline as a backdrop, and east across the ocean. North Head is a great place to spend a winter afternoon watching whales. If you've done the Spit to Manly walk which approaches Manly from the west, then it's time to explore North Head, the peninsula on the eastern side of this popular beach area. Nearest Food: Bella Vista Cafe, North Head. 1km from the lookout. By Car: Park in the carpark at the end of North Head Scenic Drive where it loops back around on itself. Parking: National Park entry fees apply. Walking distance from carpark: 500m / 10 mins. Grade 1: easy. It is a well signed, paved walkway with no steps. Public Transport: Bus or ferry to Manly. 135 Bus to North Fort Museum, North Head. Walking distance from public transport: 900m / 15 minutes. Alight from the bus on North Head Scenic Drive and continue east along the road. Stop to enjoy the view back to the city. Walk beside the road, on the left, to where there are several large carparks. At the southern end of these carparks is the start of the Fairfax Walking Track. Turn left onto this track and complete the loop. If you’ve never been to Gap Bluff, the new walkway to the top is complete and the view from up there is better than ever. It's easy to extend your walk out to South Head to the north or walk down south to Bondi if you’re keen. Then again, just sitting here whale watching is pretty good too. The nearby Robertson Park overlooking Watsons Bay, cafes and outdoor beer garden of the local pub makes this a great picnic spot to extend your outing. 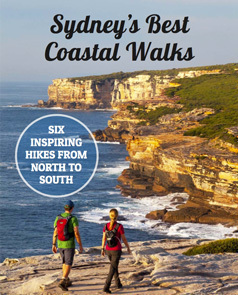 For directions, read more about the Watsons Bay Walk. One of Sydney’s most famous beaches and a hub of activity year-round, there’s more to Bondi than the beach, hipsters and muscle shirts. Did you know you can walk north from Bondi to Watsons Bay and the harbour, and south from Bondi to Bronte, Coogee and beyond? There are loads of ways to enjoy this gorgeous stretch of coastline, whale watching being one of them. Nearest food: Take your pick! Closest Street Address (for Google Maps): Sam Fiszman Park, Ramsgate Avenue East, North Bondi, New South Wales. Public Transport: 380 and 381 busses from Bondi Junction. Walking distance from public transport: 600m / 10min. Cross Campbell Parade to North Bondi Surf Club. Turn left along the esplanade, keep the ocean on your right and follow it all the way to the point. Parking: Limited paid parking at Ray O'Keefe Reserve. Free on street parking in Ramsgate Ave towards Ray O'Keefe Reserve. Metered parking on Ramsgate Ave towards Campbell Parade. Walking distance from carpark: If you’re lucky enough to snag one of the few spots near the point, you are right there. Otherwise, it’s up to a 500m walk from the metered parking near Campbell Parade. Bundeena, a little bit of paradise wedged between Royal National Park, the Pacific Ocean and Port Hacking. Also the start of Sydney’s finest overnight walk, the Coast Track. This is as close as you'll get to see what coastal Sydney looked like before European arrival. Towering sandstone cliffs, banksia scrub growing all the way to the cliff edge and ancient Aboriginal engravings dotting the rock ledges. Wheelchair / Pram Accessible: No. Nearest Food: Cafes and takeaways in Bundeena, one km from lookout. Closest Street Address (for Google Maps): 67 Beachcomber Ave, Bundeena NSW 2230. Public Transport: Train to Cronulla, ferry to Bundeena. Walking distance from public transport: 40min / 3.3km. Grades 1 and 2: Easy. Disembark from the ferry and walk straight up Brighton St, keeping the IGA and other shops on your left. After the shops you will pass a few houses and see Scarborough St on your left. Turn left up the hill, past the school on your right and continue until you reach Eric St, near the end of Scarborough St. Turn right into Eric St, down the hill and follow to the end to turn left into Beachcomber Ave. Now follow the directions below under walking distance from the carpark. By Car: Park at the carpark at the end of Beachcomber Ave (near 67), Bundeena. Walking distance from carpark: 10min / 850m. Grade 2: Easy. Follow the Coast Track signs southeast from the carpark. Pass the first left towards Jibbon Fire Trail, do not take this exit. Take the second left, signed towards the Coast Track and follow this to the end. It is reasonably well signed and if you follow these you will come to a large metal sign with an aerial image of the “Royal Coastal Walk”. A subtitle reads “The Balconies”. Look at this sign to get your bearings and continue past it towards the water. Anywhere along this exposed sandstone shelf is great for whale watching. Enjoy! 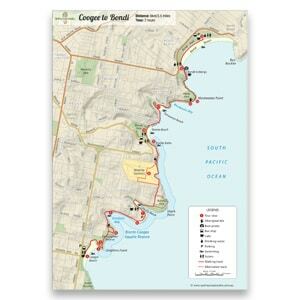 The Coast Track: 26km – 31km (depending on route). 2 days / 1 night (or one tough day for experienced bushwalkers). Grade 3 / 4. Hard. Tara: The whale watching season in Sydney runs from late May to early November. We've selected the six best Whale Watching places in Sydney. Ian: From Barrenjoey at the northernmost tip of Sydney, all the way down the coast to Royal National Park, we show you the six best, most easily accessible, and the most dramatic places to watch whales in Sydney. Ian: This is where the official count takes place for whale watching in Sydney, so this should be your first point of call. Tara: This viewing platform is manned by volunteers seven days a week during the early part of the season, and their main job is to count the number of whales that pass by. If you have any questions about whales, then there's an information board here but also on the weekends there's Discovery Rangers from National Parks who are here to answer any of your questions. As well as whales there's also lots of pods of dolphins. So it's a pretty good place to start. Tara: On the northern beaches you could just about pick any headland and get a great vantage point. But to tie it in with a short bushwalk and outstanding views, you can't beat Barrenjoey headland. I've got the Central Coast just across the Hawkesbury, Pittwater on the other side of the peninsula, and the golden stretch of Palm Beach below me, and if you're lucky, plenty of whales too. Ian: This is Fairfax Lookout at North Head, and this has got all the ingredients for a perfect whale watching spot. It's nice and high, so it’s got great elevation. The sheer cliffs mean the whales can pass really close to shore below you, and the water is nice and deep. It's also the gateway to Sydney harbour, so any of the whales you see frolicking under the Harbour Bridge or outside the Opera House, have to go past this point first. It's also wheelchair and pram accessible which is really cool. It's one of the few places that is. In addition to all of that, you've got this cracking view of the city itself. Ian: You don't get much more dramatic than Gap Bluff here at Watsons Bay. You've got the waves crashing against those sandstone cliffs behind me. You've got ocean views as far as you can see. And you've got the city skyline and the bridge. Tara: Ahh, famous Bondi. The place to see and be seen and it’s no different for the whales. If they do make it in to the bay – which is not often, but you can be lucky – then they're likely to stick around awhile before continuing on with their journey, giving you plenty of time to check them out. Ian: We've saved the best till last. This is Royal National Park. We’ve seen more whales pass within 100m of the coast here, than anywhere else. I've seen mums and calves breach just below us here. I’ve seen big humpbacks roll on their side with their massive eye and look at us on the top of the cliffs, as if this is their favourite human watching place in Sydney. But the pinnacle for me here on a still day, not only do you see the whales spout, but they're close enough you can hear them breathe. And that is amazingly special. And now that you know where to go, you’ll also need to know what to see and what to look out for when you're whale watching. We've put together a thorough list of whale watching tips including the single best week to see whales every single year. Check out the blog for more information. We might see you out here, so happy whale watching. Tagged Flora & Fauna, Northern Beaches Walks, Royal National Park, Sydney Harbour National Park.